We’ve written a bit about the lack of volatility in the US sharemarket of late. The VIX hit single figures last week, just as it did before the GFC and now another new record…. It has now been 243 days since the US sharemarkets dipped more than 3% in a day. That is the longest streak in history. Everything is awesome. SovereignMan’s Simon Black is warning that this phenomenon is contributing to what he thinks will be a very big, but importantly, very fast crash when the next sizeable ‘dip’ happens. Black thinks a lot of this has to do with the proliferation of passive investment ETF’s and their outsized effect on markets. No less than $391 billion dollars poured into ETF’s to July 2017, up on the already record high $390b in 2016. These passive ETF’s care little for valuations but just spread their buy across the whole index they are designed to track. The record inflows into these funds of course have the effect of pushing the valuations even higher. Bank of America believes 37% of the S&P500 is now managed passively. The world’s largest are BlackRock and Vanguard who collectively have over $10 trillion in assets, $7.3 trillion of which are passive, and growing by $3.5b per day. Humans are emotional creatures. And when we do finally see that 3% (or even larger) down day, investors will rush for the exits. 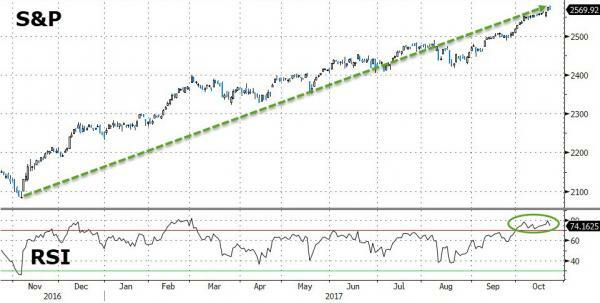 And the computers will pile on the selling (every model based on historically low volatility will completely break when volatility spikes). But when the wave of selling comes, who will be there to buy? “As these passive funds dump the largest stocks in the world, we’ll see an air pocket… nobody will be there to hit the bid. And when the drop comes, it will come faster than anyone expects. Sell some expensive stocks to raise cash. Own some gold. And allocate capital to sectors of the market that haven’t been blown out of proportion thanks to the popularity of passive investing. That means looking at smaller stocks and stocks outside the US. Further evidence has emerged that the ‘everything’ in the now entrenched “Everything Bubble” descriptor for our current market goes well beyond traditional financial markets. Whilst Canada and Australia have recently taken the global headlines for our property bubbles, the US, whose property bubble in 2006 triggered the GFC, is now above even those per GFC levels too. 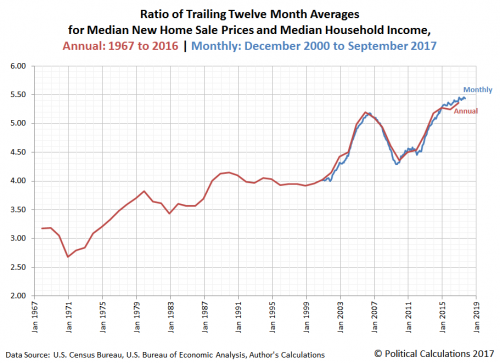 The US has seen the double whammy of strong price growth and poor income growth meaning their median new home sale prices to median household income has hit an all-time high of 5.45. For perspective Australia’s median dwelling price for combined capitals sits at around $585,000 and against the 2016 census median household income of $74,776 gives us an even more concerning 7.8 ratio. Whilst that is happening steadily the price growth is subdued. When the masses head for that door however…..
Bitcoin celebrates two milestones today. On this day 9 years ago its creator, the anonymous Satoshi Nakamoto, launched what he called Bitcoin, a “Peer-to-Peer Electronic Cash System”. Now 9 years later Bitcoin has just surpassed the $100b market capitalisation milestone and done so hitting all-time price highs, smashing through the US$6000 mark Sunday night, and up over 500% just this year to date. However for us the $100b market cap figure is more alluring for how little it is, not how big. Sure, its rise has been meteoric of late, but as we point out is the case for both gold and silver as well, compared to the $300 trillion total global financial assets or $500 trillion total global assets, $100b is barely a blip. The number of active users, too, needs to be looked at in context. Of the 7.6b world population, it is estimated only 3.9m people have a bitcoin wallet with 0.01 bitcoins or more, that is 0.05% participation. Even reports of 15m total crypto wallets (across all currencies) in existence is 0.19% but many are lost, inactive or of very little value. When you consider we’ve seen +500% gains this year with such relatively low participation and noting you can’t simply increase supply, it begs the obvious question of what happens when demand doubles to just 0.1% of the world wanting it? Or even tenfold to just 0.5%?? For a little more context on this year’s rises lets also look at the challenges faced by the world’s largest crypto currency. 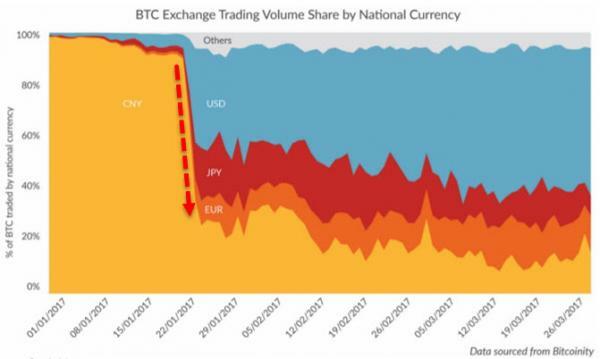 In January this year China alone accounted for nearly all bitcoin trade as the Chinese piled in. Then Japan legalised it as a currency the next surge came along, along with a return of the US and famously took bitcoin past the price of an ounce of gold. More recently we saw China’s government crack down on ICO’s (initial coins offerings of new alternative coins) and then domestic exchanges, seeing a 30% drop in the price. However since then the Chinese have moved to other means to continue trading and we’ve seen more recently moves by the big Chinese exchanges to more friendly jurisdictions in Asia, notably Japan and Hong Kong, but with Singapore and South Korea coming too. Japan’s regulators approved 11 new exchanges in September alone. This week the RBA joined a chorus of concern about how government can control this peer to peer network. They are clearly worried about a growing awareness of an alternative to their fiat currencies and their slow, centralised and expensive banking network. What bitcoin has proven this year, reaching its 9th birthday in spectacular fashion, is that it is resilient, exhibits intrinsic value by virtue of constrained supply, has a fast growing acceptance as a medium exchange (including buying bullion from us! ), and on any helicopter view of it in the context of the financial market it plays in, appears to be still very much in its formative stages. Two of Wall Street’s bigger players announced strategic moves into the monetary assets of gold and bitcoin over the weekend. First, as we reported last month, Michael Novogratz has launched a crypto currency fund, Galaxy Investment Partners, investing largely in bitcoin, a “very big” holding of ethereum, and 30-35 other tokens and companies. The largely anticipated correction on bitcoin happened late last week and Novogratz was there at the bottom jumping in and purchasing $15-20m worth over the weekend as the price jumped back up $1000 from its bottom. He sees bitcoin hitting US$10,000 ($13,000) by March. In an interview with Reuters he said he believes other large institutional investors are around 6-8 months away from adopting bitcoin. One (though unnamed) ‘big financial firm’ could launch what he called a ‘turning point product’ within 6 months. Yesterday the World Gold Council released their latest Gold-backed ETFs update for October. ETF holdings increased just 3.3 tonne, up to 2,347.6t globally. That came about from Europe adding 11.2t, North America losing 8t, and Asia (who generally prefer the real thing) up 0.8t. This is in line with the trend we outlined last week here of the US going ‘all in’ to the ‘everything’s awesome’ financial markets. That said, year to date, inflows to gold backed ETF’s is up a solid 8%, 182.2t or $7.8b so far. It was a rough night on Wall Street last night on the back of a raft of ‘everything is awesome’ shattering economic data. Another stronger than expected inflation print (CPI up 1.8%) saw gold and silver stronger and raised concerns of a December rate hike, but then we saw a post hurricane crash back to reality in retail sales (just 0.2%), the biggest drop in the Empire Fed survey in 7 months, and the 3rd straight month of declining real wages (a first in 5 years). Deutsche Bank has released their view on this and it highlights the absolutely precarious nature of the position the Fed (in particular, but central banks more generally) have put the market in and how very difficult it will be to manage us out without triggering a crash of epic proportions. “The largest, and possibly, the only risk capable of resetting the vol higher is the tail risk associated with bear steepening of the curve and disorderly unwind of the bond trade. This is the risk that would be probably impossible to control, its trigger being either excessive deficit spending or inflation. So watch these signs like we saw last night carefully around inflation, market ‘health’, and that all important yield curve’s response. The old and the new forms of real money both surged over the weekend on the back of a host of catalysts. 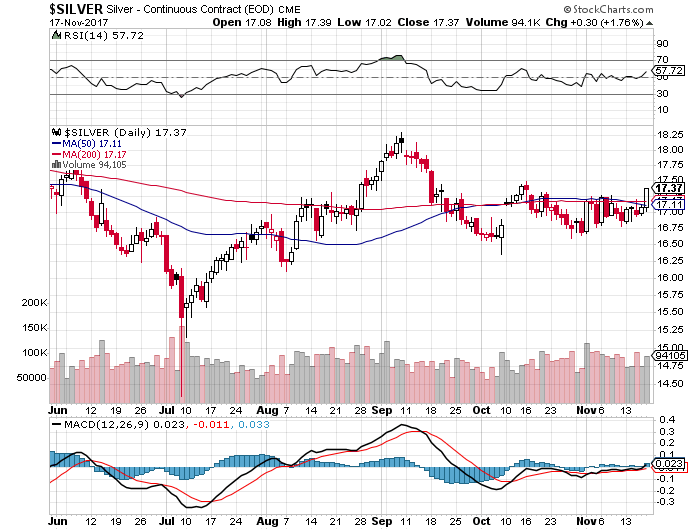 Gold jumped $20.48 (1.21%) and silver 30c (1.32%) Friday night, taking both comfortably over their 200 day moving average. That was the biggest jump in 3 months and putting gold very close to the magic US$1300 again. But on the back of firstly Venezuela’s PDVSA defaulting (previously discussed here), and then Mugabe’s resignation backflip this morning in Zimbabwe we saw bitcoin sore above US$8000 for the first time. But if you think US$8000 is impressive, consider that in Zimbabwe it traded at nearly US$13,500 as locals piled in trying to preserve their money in the troubled nation. Bitcoin gives them the double benefit of being impossible to confiscate and easy to move offshore. Throughout history gold and silver have played the role of real money as fiat currencies collapse, just as we are witnessing right now in Venezuela and Zimbabwe. Bitcoin is now joining those ranks, adding fuel to an already hot market. Visitors to our office will have seen one of our $50million or $100trillion Zimbabwe notes. Both are essentially worthless, such was the hyperinflation in Zimbabwe. Venezuela too is experiencing something like 2400% inflation right now. Is it any wonder people flock to real money? Is it any wonder we discount the concern that gold and silver don’t offer a ‘yield’? Monetary assets are all about preserving your wealth as fiat depreciates every day and inflated financial markets crash. 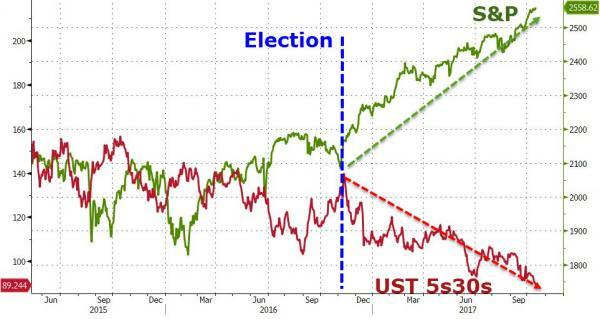 The world has just experienced (and still is) historically unprecedented money printing through quantitative easing. To date that hasn’t played out in the normal general inflation expected of such stimulus. 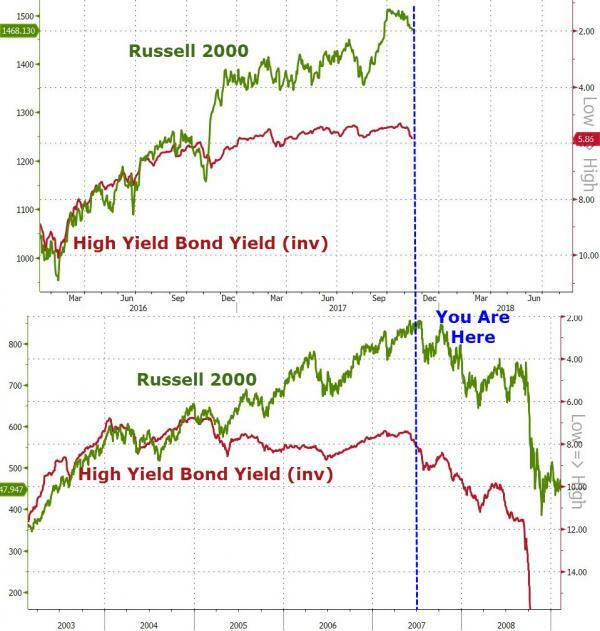 What it has done is inflated financial assets to record highs. The big questions are when will that bubble pop and when will that general inflation be unleashed? 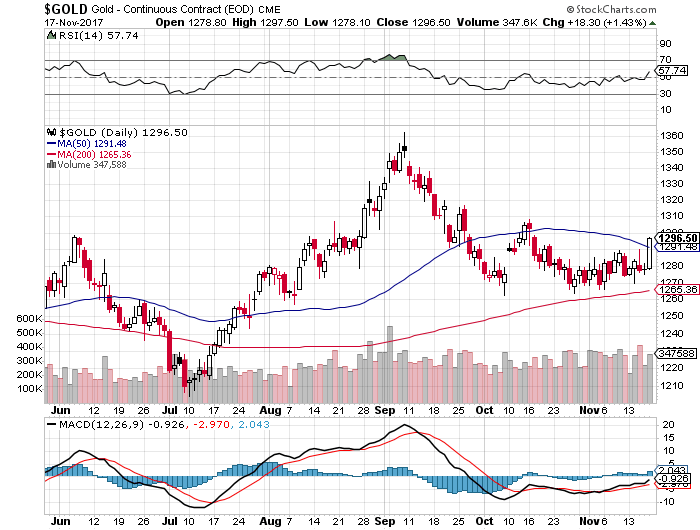 Gold loves either scenario…. But we are in ‘the lucky country’ right? Such currency craziness could never happen here…. We’ll discuss that more tomorrow…. What a 24 hours! Yesterday we reported gold had its best session in 3 months but last night it had its worst in 4 months?! (down AU$23 and silver down AU$0.56). If that isn’t confusing enough, it happened after we learned Angela Merkel failed to form a government throwing German politics into chaos. Normally that would see a flight to safety but instead shares rallied and gold fell, albeit probably in a knee jerk to the USD rallying on the falling EUR. And so continues gold’s ‘bounce along the bottom’ albeit with a steady rise off that November 2015 bottom. Gold is up 6% year-to-date and silver up 1%. By comparison, and it’s a comparison people can’t ignore, bitcoin is up 710% this year and hit a new all-time high last night. It’s a pattern testing people’s patience with the ‘hard’ assets of the 3 noted above. However if you remove the emotion and look pragmatically at the situation, you really shouldn’t be surprised nor disheartened. US shares are hitting all-time highs and Aussie shares getting closer to revisiting their pre GFC high too. Gold and silver are your uncorrelated investment so really you should be expecting them to languish in such an environment. We will concede this financials bull market has lasted longer than most, but again unemotionally, despite the absurdity of what’s fuelling it, the amount of central bank stimulus put to this market should see it last longer than you’d expect. FOMO or ‘fear of missing out’ is the emotion that needs to be held in check at such times. Read again our Financial Maths 101 article. Every day that this financials market breaks record highs is a day closer to that math playing out. We mentioned yesterday we’d talk about Australia being ‘different’ – we are of course ‘the lucky country’ are we not? For a start few realise that term was originally coined facetiously in the context of us squandering our gifted resources. Over the weekend you may have seen an article picked up by many majors titled “Australia’s economy is built on shaky foundations” authored by Matt Barrie and Craig Tindale. It is a must read for anyone in the ‘Australia’s different’ camp and we’d respectfully suggest it reinforces our point above about maintaining an uncorrelated balance in your wealth portfolio, ala physical gold and silver bullion. You can (and should) read the full article here but if you are short on time let us highlight some key text. “With an economy that is 68 per cent services, as I believe John Hewson put it, the entire country is basically sitting around serving each other cups of coffee or, as the Chief Scientist of Australia would prefer, smashed avocado. Successive Australian governments have achieved economic growth by blowing a property bubble on a scale like no other. “Urban planners say that a median house price to household income ratio of 3.0 or under is “affordable”, 3.1 to 4.0 is “moderately unaffordable”, 4.1 to 5.0 is “seriously unaffordable” and 5.1 or over “severely unaffordable”. We remind you too that Australia’s sharemarket is dominated by our financial institutions than any other in the world. And finally, and in a final reminder of our ‘maths’ fixation…. “We can’t rely on property to provide for our future. In 1880, Melbourne was the richest city in the world, until it had a property crash in 1891 when house prices halved causing Australia’s real GDP to crash by 10 per cent in 1892 and seven per cent the year after. “We took the view in the 1970s — it’s the old cargo cult mentality of Australia that she’ll be right. This is the lucky country, we can dig up another mound of rock and someone will buy it from us, or we can sell a bit of wheat and bit of wool and we will just sort of muddle through. Since the last US Fed meeting at the beginning of this month, gold has outperformed all major asset classes, including the bull market S&P500, as the USD dropped. The market isn’t buying the December rate hike and ‘(QE) asset normalisation’ program. “But I remain sceptical about a December hike. As I explained above, the market is looking in the wrong places for clues to Fed policy. Jobs reports are irrelevant; that was ‘mission accomplished’ for the Fed years ago. The key data are disinflation numbers. That’s what has the Fed concerned, and that’s why the Fed might pause again in December as it did last September. We’ll have a better idea when PCE core inflation comes out Nov. 30. Again, the October data will not be available until Nov. 30. The Fed’s target rate for this metric is 2%. It will take a sustained increase over several months for the Fed to conclude that inflation is back on track to meet the Fed’s goal. There’s obviously no chance of this happening before the Fed’s December meeting. A weak dollar is the Fed’s only chance for more inflation. The way to get a weak dollar is to delay rate hikes indefinitely, and that’s what I believe the Fed will do. And as for that financial markets bubble they are creating whilst they don’t raise rates? So again we have a Fed stuck between the ‘real world’ deflationary rock and the ‘financial assets’ inflated hard place. It’s hard to think of a result that isn’t favourable to gold. 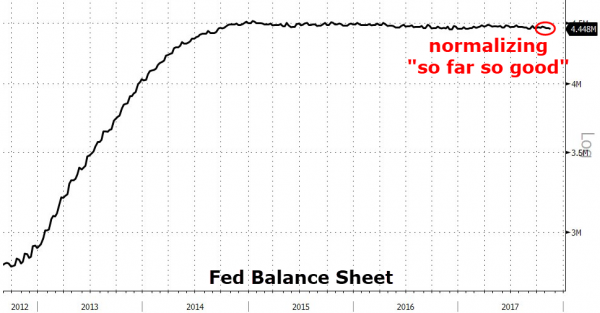 If your eyes can’t pick it, of the $4.5 trillion in bonds they bought with freshly printed money, they have reduced it by 0.17%.... Hmmm, and no reaction? Could it be, like rate rises, the market has come to expect more verbal implementation than actual implementation? I miss the articles. Please come back! vanquish wrote: I miss the articles. Please come back! Nice and simple today. We present an info graphic on silver that firmly puts in to perspective why many believe it is the most undervalued commodity in the world today. Below is a small excerpt but we urge you to click on through to the high definition and complete graphic. BIS, the Bank for International Settlements, is often referred to as the central banks’ central bank. They (now) famously were one of the few such bodies that warned of the pending repercussions of the risky lending levels that triggered the GFC just before it unfolded and are warning we are in similar territory now. “Stock valuations may drop when the dividend and buyback frenzy eases. In the U.S., companies increased their share of net income paid out in dividends by more than half over the last five years as buybacks swelled. The dividend payout ratio is back to the relatively high levels of the 1970s and therefore may be reaching an “upper bound,” the BIS said. Indeed… check out these charts from the BIS report…. “First, and most obvious, the jury is still out. There is a sense in which the tightening has not really begun. The vulnerabilities that have built around the globe during the unusually long period of unusually low interest rates have not gone away. As underlined in this Quarterly Review's special features, high debt levels, in both domestic and foreign currency, are still there. And so are frothy valuations, in turn underpinned by low government bond yields - the benchmark for the pricing of all assets. What's more, the longer the risk-taking continues, the higher the underlying balance sheet exposures may become. Short-run calm comes at the expense of possible long-run turbulence.